Warm Fuzzy Plains is World 1-1 in Paper Mario: Sticker Star. Here, Mario learns how to Paperize and receives his first Thing. 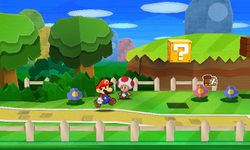 There are many Toads and signs that give the player information about gameplay. It is a grassy area with several fences. There is a bridge over a river about halfway through the level. In this area, the Toads are on a hunt for stickers. They mention that one Toad has gone ahead. As Mario is about to cross the bridge, a Toad runs into him and drops the Scissors Sticker. He lets Mario have the sticker, then runs off, telling Mario to fight the scary monster. Bowser Jr. arrives in his Junior Clown Car and battles Mario. After Mario defeats him by using the Scissors Sticker, Bowser Jr. becomes angry and moves the bridge to a high ledge that Mario cannot reach. Mario goes back to the Toads and asks them for help in retrieving the bridge. The Toads form stairs so that Mario can get the bridge, and Kersti teaches Mario how to paperize. Mario continues going forward and finds his first Thing in a cave. Kersti does not know what it is, so they just put the Scissors in the album. Mario continues along the path until he sees a piece of the Sticker Comet. As Mario is about to get it, the three Goombas from Decalburg attempt to stop him and turn into three Paper-Cone Goombas and attack. Mario defeats them and collects the piece of the Sticker Comet. Later, when Mario comes back with a Secret Door, he can stick it on a cliff outside the cave with the Scissors Thing to obtain the Thumbtack. The Warm Fuzzy Plains have a fairly basic layout; it mostly comprises a flat grassland, with a small river and waterfall running through. A small set of hills is also found here, with a small hollow hidden in the cliffs that contains a Scissors item. The outline for a Secret Door sticker is found along the cliff wall in the area with the cave Mario finds the Scissors. The door leads Mario to the Thumbtack. The Warm Fuzzy Plains sure do make a sticker feel warm and fuzzy. That ripped-out bridge scrap is all the way up there! Do you think anyone can lend us a hand? Let's take that torn-out bridge scrap back to where it was originally. I'll show you something good! The bridge is fixed! Let's move on. This page was last edited on April 24, 2019, at 17:48.